"In early 1993 Anne Raugh and Steve Leete decided to try their hands at forming a contemporary a cappella group. They hand picked the first singers mainly from NASA's Goddard Space Flight Center's Music and Drama (MAD) club, of which both Anne and Steve were prominent members. This 12-voice a cappella chorus went by the name The OK Chorale. Both Steve and Anne were great examples of the coexistence of science/technology know-how and musical ability in the same brain. In fact, once the OK Chorale was in place, Anne quickly got up to speed as an a cappella arranger, and is now known throughout the a cappella community as an arranging whiz! photo on the scoreboard at Camden Yards The OK Chorale's first performance was a lunchtime concert at Goddard in June 1993. When a soprano spot opened up, Karen Smale and Padi Boyd first met on the night both auditioned, and both got in! Alan Smale came onboard after a memorable gig at which our bass at the time never showed! Additional voices Angie Russo, Deb Nixon, Paul Kolb and Lisa Kelleher came onboard when several members took jobs out of state. Over the next several years, the OK Chorale went through the typical a cappella teething troubles, trying on many styles, losing and gaining members, and even enduring the name change to "The Chromatics." But we did change it in time for our big debut at Camden Yards singing the National Anthem for the Orioles! Quite a few people have asked how we came up with "The Chromatics." In our geeky tradition, we chose a word that had both music and science connotations: the chromatic scale (C, C#, D, D#, E, F, etc.) and the chromatic colors (the colors of the spectrum). Little did we know how this presaged our future marriage of music and science in AstroCappella! " 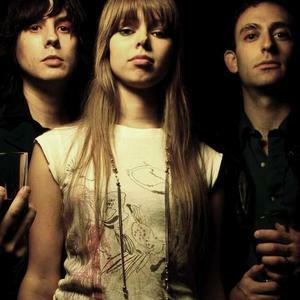 "The Chromatics are a unique high-energy vocal band that delights audiences with a combination of outrageous originals, crazy covers, melodic insights into modern life, and a smattering of science songs. The Internet, television, and fast food - they're all subjects of Chromatics originals. The Chromies have taken their astronomically-correct a cappella songs, a project called AstroCappella, from Palm Springs, to Orlando, from Las Vegas to New York, and their CD has flown in space! And no, we're not kidding!" "The Chromatics is vocalist/guitarist Adam Miller and new bassist/ vocalist Nat Sahlstrom, reduced from the band's 4-piece lineup circa their "Chrome Rats..." full-length. For their new album, the dark, ever-turbulent combo temporarily recruited reknowned percussionist Ron Avila (of GET HUSTLE, HOLY MOLAR and formerly ANTIOCH ARROW and FINAL CONFLICT fame) to round out their swirling, hypnotic punk-dubs and help ?steer the band into rhythmic bliss?. The resulting 10 tracks, titled 'Plaster Hounds', were recorded in July 2003 by Jeremy Romagna at Type Foundry Studios, are often-bleak post-punk dirges that frequently blossom with unexpected melody and sophistication. Comparisons to NY pioneers of the sixties and seventies like SUICIDE and SILVER APPLES aside (indeed they include a passionate rendering of the APPLES' 1968 classic ?Program? on 'Plaster Hounds'), the Chromatics have succeeded in reinventing themselves while paying homage to the foundation laid by the original quartet on 2002's 'Chrome Rats vs. Basement Rutz' album. 'Plaster Hounds' is the sound of the new minimalist cacophony."